Jean Stephens is responsible for bringing together a collective of strong national accountancy firms from all over the world that makes RSM the network it is today. She believes that the success of RSM International hinges on these firms having the same vision and passion for providing quality services and on each firm putting their clients first. The bedrock of success, she believes, also lies in building trust and mutual respect between member firms, and between individuals. 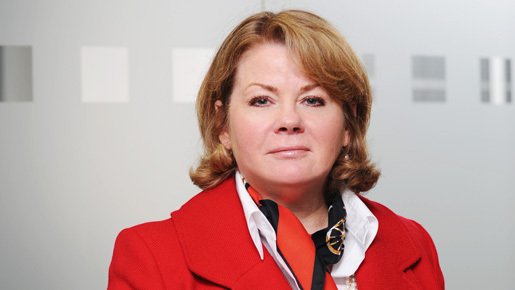 In 2005, Jean Stephens was appointed RSM’s chief executive. Five years on, the network is enjoying some of the best growth rates in the industry and Stephens has big plans for the future. And planning is something she does well. When asked about future strategy for RSM, Jean reveals that she’s currently working to a five year plan for the network but, in fact, is always looking ten years ahead. Having always had a flair for numbers, Jean studied accountancy at university and soon after, set herself an ambitious career goal. Her first target was clear; to become a partner by the time she was 30. She did and by age 34, she merged this accounting practice into the RSM International member firm in the US. Jean’s next goal was to live and work in Europe and in 1995, when Stephens was offered a role within the Executive Office of RSM International she packed her bags for London. More than a decade later, American born Jean is today also a proud UK citizenship holder. Stephens, who spends as much as 80 percent of her time on the road, uses the language of the veteran diplomat and negotiator rather than a double entry accountant. She talks about aspiration, vision, relationship building and shared journeys. Clearly, her message is reaching its target – in the last year, RSM welcomed new member firms in Japan, Tunisia, France, Brazil, the Channel Islands, Bahrain and Oman. RSM members benefit from regular internal communications and high-quality resources including frequent local, regional and international conferences, centres of excellence, international secondments and a high-quality international training programme, all designed to build relationships across the network and share best practice. RSM has even designed relationship building into its quality monitoring programme, with routine inspections being carried out by partners from other firms within the network as part of their time commitment to RSM International. Defining this personality is a major part of her job in selecting new members to join the network. There is a clear profile that RSM is looking for: an established firm in the top ten in its local market, with quality standards fit for international markets and clear aspirations to grow and serve their clients better. Potential members want to have access to global resources and connections, and they believe that they can both learn from and improve their own business through sharing best practice within a network of equals on the international stage. Members also have an entrepreneurial streak that is a consequence of their status as an independent business within their local markets. Many member firms have been formed by professionals who started their careers working in one of the ‘Big Four’ global accountancy firms, and subsequently decided that they wanted to start their own firm. This spirit of entrepreneurship is an important part of RSM’s ethos, and echoes the profile of its clients. “We are in a great position right now,” says Stephens. “Our member firms can service large multinationals as well as ambitious and entrepreneurial clients who are on a journey of expanding within their local markets and then becoming multinational. We can help them with all the cross-border issues that will bring. We are able to travel that journey with them, offering not just audit, but tax and advisory services in all the markets they are growing into.” To celebrate the importance of entrepreneurship and to support companies in Europe to gain recognition of their success, RSM has sponsored the ‘RSM International Entrepreneur of the Year’ award within the European Business Awards for the last four years. The network is also investing in building internal leadership teams and has a Centres of Excellence structure to pool knowledge and develop strategies on key tax, audit, risk management, transaction support and other finance related issues. The aim is constantly to add value to clients, but these bodies of knowledge also enable the group to establish its voice on matters of public debate. RSM International has recently submitted a response to the European Commissions Green Paper, ‘Audit Policy: Lessons from the Crisis’. For RSM, participation in these, and other important policy discussions, is a vital part of the network’s commitment to developing the profession and continually raising industry standards benefiting both the professionals and clients alike. According to Stephens, the growth and success of RSM has been squarely down to member firms implementing quality standards and building strong internal and external relationships. She wants to see RSM International receive the recognition it deserves, to continue to move up in the global rankings, and to become the employer of choice for the best quality graduates. “Quality is our cornerstone and always will be. The groundwork has been done and the mindset of our member firms is in the right place. However, there is always room for improvement and we continually look to adapt our reach.” Stephens adds: “Much of the work on the accounting and audit side is becoming more commoditised. There are now some great opportunities to provide our skills in other consulting areas such as transaction support, advisory services, tax and risk management.” The network is also targeting emerging industry sectors, such as CleanTech (green energies), and further building upon its strengths and capabilities in Asia, the Middle East and South America. “For years now, RSM has been the world’s best kept secret,” she laughs. “This is now about to change”. Who would doubt her ability to achieve this goal?